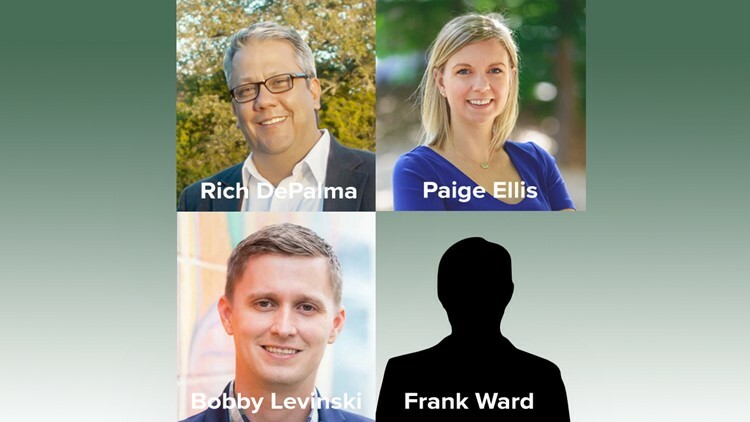 Rich DePalma, Paige Ellis, Bobby Levinski and Frank Ward hope to represent District 8 in Austin City Council. Ellen Troxclair has announced she will not seek re-election to represent southwest Austin's District 8. Four candidates now hope to fill her seat. AUSTIN — Southwest Austin’s District 8 council member announced in July she made the “difficult” decision to not seek re-election for a second term come November. District 8 Council Member Ellen Troxclair was first elected to the new 10-1 Austin City Council back in November 2014 in a historical run that made her the first council member of that district. Troxclair has endorsed a candidate to take her place, but three others have thrown their names into the hat as well. A small business owner, DePalma said he has worked in the southwest Austin community for several years. He currently serves as vice chair of the Austin Parks and Recreation Board, and is involved with the City of Austin Downtown Commission, Austin Independent School District and the Balcones Canyonlands Plan Citizens Advisory Committee, his campaign website states. He hopes to protect “what makes southwest Austin special,” to promote creative infrastructure solutions for District 8, to bring “our fair share of city resources to the district,” and to ensure the community’s public safety needs are met, his website said. A southwest Austin resident for nearly a decade, Ellis works as a marketing and public involvement specialist for Austin-based environmental consulting firm, aci Group. She said she has also been an activist and financial supporter of progressive causes for almost 10 years. She is involved with the Texas Book Festival and Keep Austin Beautiful. Involved in city policy since 2005, Levinski has served as policy advisor for Mayor Pro Tem Kathie Tovo, Council Member Laura Morrison and Council Member Jennifer Kim. Currently, Levinski is an attorney for the Save Our Springs Alliance, an environmental non-profit that works to preserve Austin’s natural resources. His campaign website states he was involved in negotiations to transfer development rights so Austin’s school district could expand schools in southwest Austin. He also said he’s advocated for more fire stations and parks and has been an ally of the Fix290 Coalition, which works to bring non-toll road improvements to the “Y” in Oak Hill. “Through his service on the City’s Parks and Recreation board and extensive involvement in our community, he has shown a clear understanding of the needs in southwest Austin and a deep commitment to the people who call it home,” her statement said. Ward has experience working at the Export-Import Bank of the United States and has served in the White House, the U.S. Senate and the Texas State Capitol, his campaign website said.